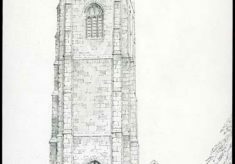 Original drawing by John Clark of the church priory of St. Germans (St. Germanus) in Cornwall. 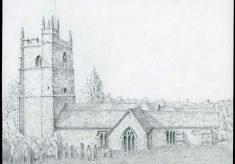 The drawing shows the front elevation with central doorway and decorative arch, with two towers either side. 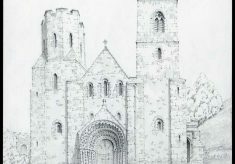 Pencil drawing on white drawing paper. 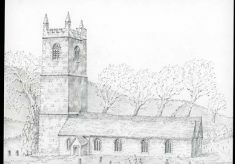 Original drawing by John Clark of the church of St. Tallanus in Talland, Cornwall. 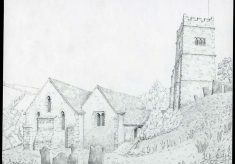 The drawing shows the main church building on the left and the tower on a small hill to the right. There are some graves and a small slope in the foreground and trees beyond. Pencil on white drawing paper.